"My grandmother had made no-bake cookies so much, she was never seen looking at the recipe. This recipe was obtained from a local nursing home and is so easy my 9 year old makes them and the flavor is changeable to your taste. I generally make 2 batches so that we don't have to store half a can of evaporated milk. Our favorite flavors are made with chocolate fudge or butterscotch pudding." In 3 quart microwaveable bowl, combine the sugar, butter and evaporated milk. Cook on high power for 2 to 5 minutes, stirring occasionally until the mixture comes to a rapid boil. Allow the mixture to boil undisturbed for 20 to 30 seconds. Remove from heat and stir in the instant pudding and oatmeal. 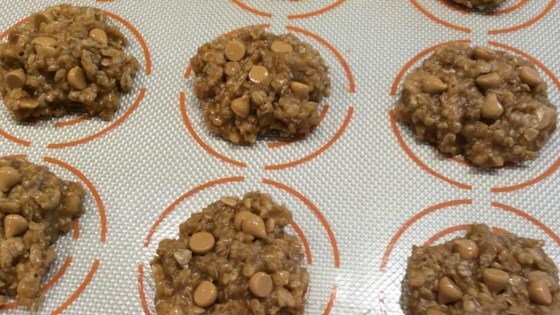 Spoon onto waxed paper lined cookie sheets. Allow to sit at least 15 minutes or until firm.